As a business grows support inquiry raises simultaneously then support assistant can’t provide quick resolution to all at the same time you may miss customer permanently better to use helpdesk to increase support efficiency. Choosing right helpdesk software solution from the very starting of business gives you much than the charges you pay for because switching the helpdesk or helpdesk migration both are a really massive task to execute. Not every helpdesk system are secured, scalable, highly flexible for customization, robust to deal with multi-functionality, plenty of support request, multi-action execution in the meantime with the same speed. Everything is possible for the human to do but there is a limit no matter how efficient or talented your support agent is but he can’t reply 1000+ clients in a day but using a tool built using human mind power for sure can do so. Every business entire the world planned to expand and grow with the large customer base and almost every SaaS-based helpdesk are charging per-agent cost which will eat a big portion of business profits. Rapid business growth will generate revenue along and a large number of customer base, if you have a huge customer base for sure there will be plenty of support request to solve and that will be needing many agents. Using Freshdesk for multiple agents, team or group will an expensive solution to employ for providing better customer support experience. Work splitting for better support management by creating multiple agents, teams, and group divided for the specific purpose so that inquiry could reach to the dedicated person for the immediate resolution. One thing is sure that pricing is going to be up and up and switching helpdesk form one to another to lower the cost is not the right solution even when we all know that helpdesk migration is a massive task to execute. Hence, UVdesk Open Source Helpdesk Software is there to create unlimited agent, team, and group to utilize the automated tools, ticketing tools, and all other tools to streamline the overall support process to respond faster. 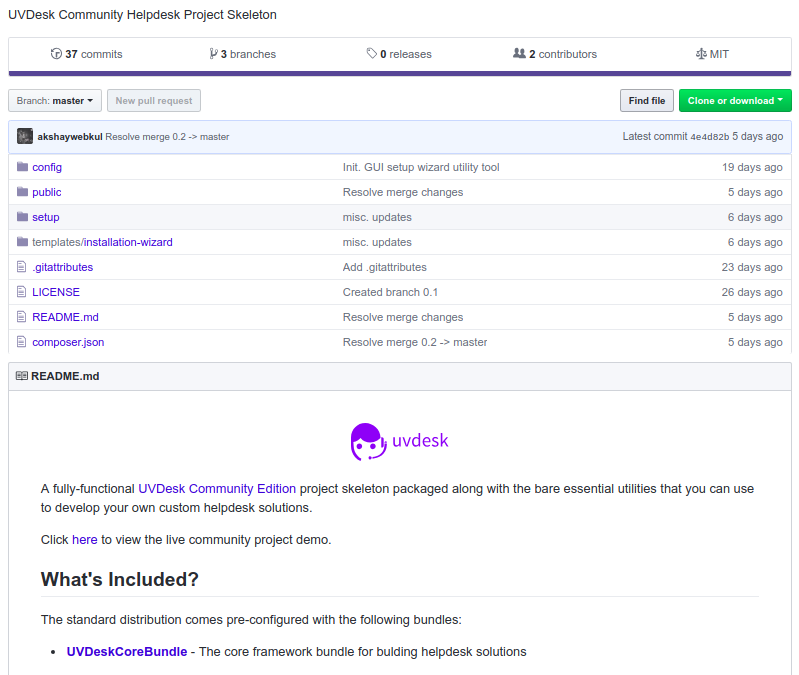 Go for Free Open Source Alternative to the Freshdesk — UVdesk is available as SaaS-based and Symfony PHP Framework based Open Source Helpdesk to streamline the overall support process for better customer support. Check out Enterprise Open Source Helpdesk — UVdesk a true alternative of any mature or standard helpdesk. 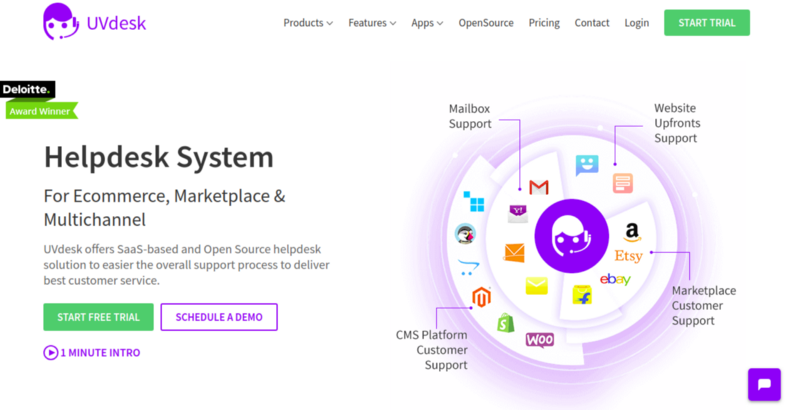 UVdesk Open Source is PHP-based customer support software built on reliable Symfony PHP framework and written in most popular language PHP+MYSQL which is highly secured, robust & customizable to be fit for any trade. Choosing right helpdesk software solution gives you much than the charges you pay for. Now every merchant can have their custom helpdesk for free installing Enterprise Open Source Helpdesk. That’s why UVdesk Open Source allows creating multiple-agent-team-group event-based system, email piping, mailbox, productivity tools, ticket management tools, knowledgebase, ticketing system and many more. Hence, UVdesk Open Source Helpdesk Software allows creating unlimited agent, team, & group to utilize the automated tools, ticketing tools, and all other tools to streamline the overall support process to respond faster. PHP-Based Open Source Ticket System-UVdesk enabling you to get the same value equivalent to any exclusive SaaS-System like Freshdesk then why to pay more for the same feature if you can get for free. Automated workflow, ticket tags, saved replies and prepared responses will enhance the efficiency of support agents to deliver instant customer support. Workflow: Configure department specific rules that automatically sends an e-mail notification, assigns responsibility to support agents and update field values when matched with the defined execution criteria. Workflow allows automated but pre-set personalized acknowledgment, notification, and instant solution delivery which benefits the whole business. 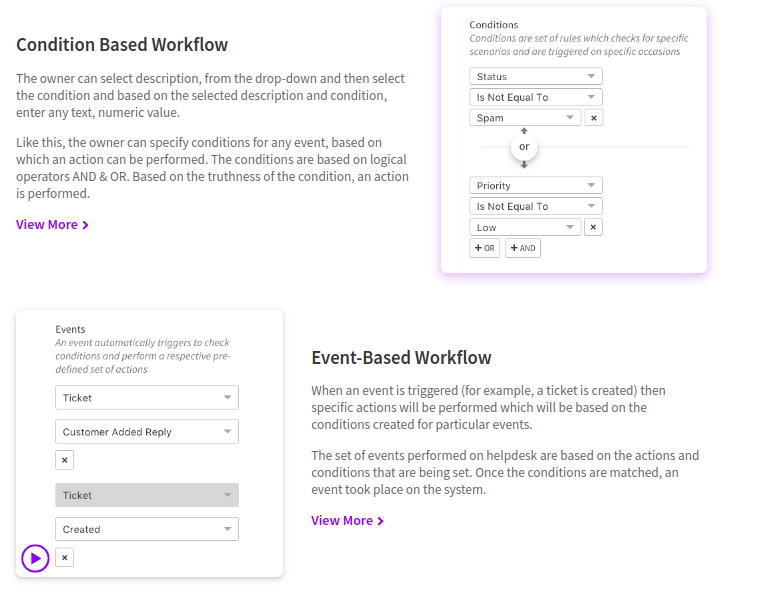 Events are predefined functions specifically Ticket, Agent, Customer. Conditions are available for Mail, Ticket, Customer, and consist of two buttons- AND, OR. For AND option all the mentioned conditions have to be true then further execution will take place while for OR option either one of the conditions needs to be correct. Actions will occur or applied in the event when an event gets matched with the specific conditions. 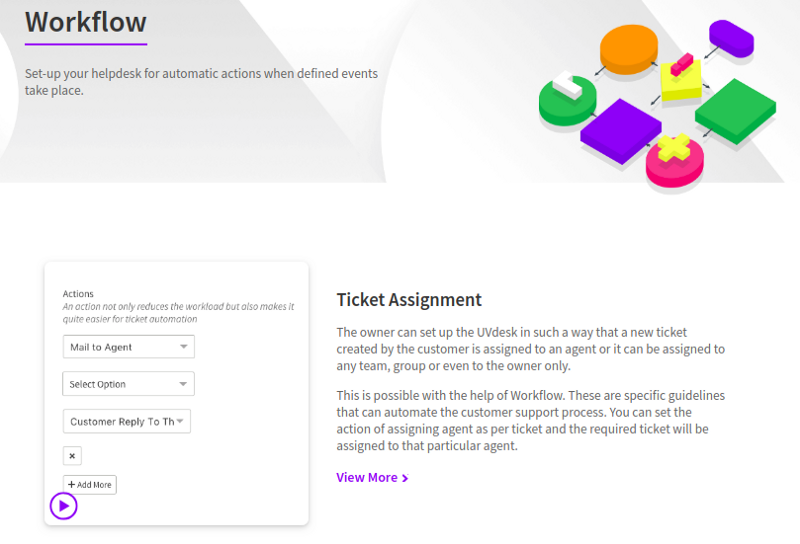 Brilliant ticket management tools same as offered by any standard helpdesk like Freshdesk are also available in UVdesk Open Source. Smart ticket tools to easier the task and speed up to reduce the response rate time are also offered by UVdesk Open Source Symfony Based Helpdesk likewise the Paid Freshdesk Helpdesk. Ticket management tools like adding attachments, multi-thread addition, secret note on the ticket, ticket list mass action, editing, deleting and locking the threads, and label helps to resolve the service ticket in right way. A maintained knowledgebase created using folder, category, article is also a time-saving tool that can be referred by support agents to provide complete detail and customer can use that anytime as it is self-served. A well-managed knowledgebase can reduce service ticket count by 40–50% and can save the time of support agents up to 50%. Utilize it for free using UVdesk community-skeleton instead of paying to Freshdesk for the same. Freshdesk and all other helpdesk are charging way too much than the features they’re offering but live reporting and analytics are free with Enterprise Open Source Helpdesk. UVdesk Open Source offers full control plus live reporting to get the accurate performance report of agents, live ticket counts and customers feedback on the provided support for the better supervision & performance improvement. Appreciate top performed support agents which will motivate them and others to maintain the same to increase support efficiency. Prepare email template, show your branding, block/spam unwanted queries to escape from fraudulent queries to utilize that time to support needy customers. All the features which we have allowed in our SaaS-helpdesk or exist in any inclusive helpdesk like Freshdesk are available in free open source UVdesk. Every trade has their own particular norms and way to deal with the customer so their requirement or expectation with helpdesk system is also different. The way of providing or dealing with the client in B2B business includes many challenges and I’ll be explaining the same with a case. In the aura of GDPR a regulation of EU law, to solve such kind of B2B requirement rightly coded, flexible for customization, scalable, secured and high-performance helpdesk software is highly important. Such kind of feasibility lacks in SaaS-Based helpdesk solution, high-end customization is a massive task to do because right at the moment every SaaS-helpdesks are running on the single instance. So any change in SaaS-helpdesk will reflect on all other clients who so are using that system but all kind of integration, customization, and configuration is possible with UVdesk Open Source Customer Support Software. Every trade has their own way of dealing with customers as per their defined business criteria which usually requires customization or integrations sometimes with 3rd party API, e-commerce platforms or applications. For reducing the barriers to change and allowing others for the faster innovation to contribute or build integrations thus the APIs are the backbone nowadays which helps in creating a better product. In order to be a jack system to be easily suited for all the trade and each will be having the unique demand which will only be possible only through customization with requires bulky and high- technical effort. Which is possible to do in SaaS helpdesk solution but till when solution provider will be changing the system for all on each customization demand. Customization is still okay it is possible to do anyhow but business has to pay for the customization charge because it is hard to find the developer who’s familiar with the helpdesk and its the code you’re using for your business. Saas Solution offers very limited amount customization but Symfony PHP framework based Open Source Helpdesk solution allows you any amount of customization means it is endless to customize. Symfony & PHP both have huge community support & both are famous among the developers & you can easily find a developer to get a complete solution for your business utilizing the source code of PHP-based helpdesk. If you’re stuck somewhere a huge for sure you’ll find the solution for your problem as PHP and Symfony has huge developer base familiar with. As we all know Symfony is constantly improving, updating and modifying and setting up the milestones which are for sure gonna speed up the development of any standard, simple or complex web application.